The three day battle for the Far East wrestling championship banners ended with the Kinnick Red Devils winning both individual and dual titles for the first time since 2001. The Far East tournament had mainly been dominated by St. Mary’s International School for the last 7 years with the Titans capturing 10 out of the 14 possible titles and the Kubasaki Dragons and Kinnick sharing 2 titles each. The Titans headed to Yokosuka Naval base prepared to take their fifth consecutive Far East title (a feat no team has ever accomplished before), but fell just 1 match short for both titles to take home 2 silver medals and plaques. Kinnick took the individual champion title with 99 points over St. Mary’s with 94 points. The dual tournament finals ended 30-28 for Kinnick. “That [the difference in points] just means we just needed 1 match to go our way for both titles, which means if it had been another day, we could have been the champions; it was just Kinnick’s day” commented Coach Yabui of the Titans, emphasizing that there was no difference in the quality of the teams. In fact, in terms of quality, the Titans had an edge over the Devils as all 12 wrestlers placed in the individual tournament while Kinnick had 2 wrestlers eliminated from the tournament. 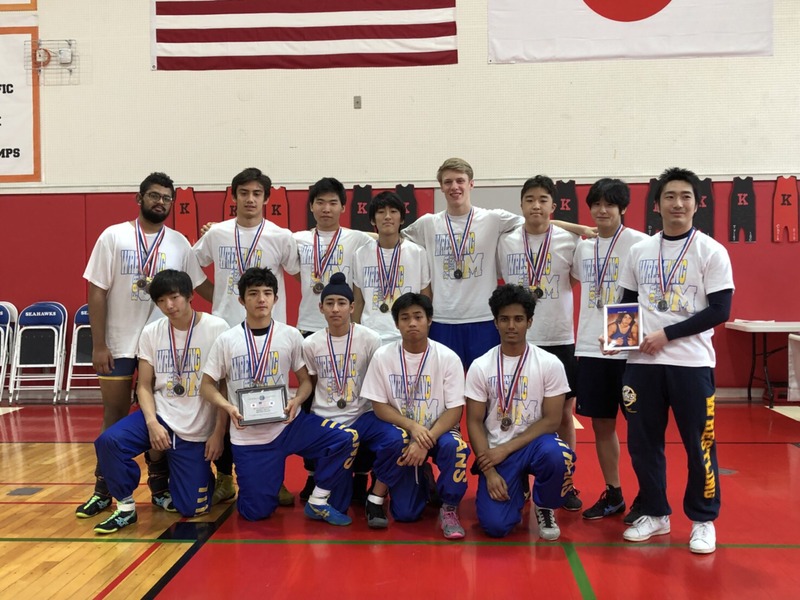 However, while St. Mary’s only had 2 out of the 8 finalists win the gold, Kinnick had 6 out of the 8 finalists triumph to tie the most number of Far East champions in a tournament set by Yokota (1978), Kubasaki (1991), and St. Mary’s (2015 & 2016). Freshmen, Jasjot Bedi at 101lb finished strong in 3rd place with constant improvements in his wrestling throughout the tournament. Eiji Kasahara at 108lb, only a freshmen, dominated his bracket to be crowned a 9th grade Far East champion. Harold Mancia at 115lb pulled off a major upset against his rival from CAJ in the semi-finals to make the finals to finish runner-up. Captains Tatsuhito Matsumoto, 122lb, and Rio Lemkuil, 129lb, both made it to the Far East finals for 3 consecutive years. Dai Matsumoto, 135lb, and Austin Koslow, 168lb, dominated all opponents until the finals to place 2nd. Jihoon Seo, 141lb, finished 4th. Junior, Nishant Chanda at 148lb made it to the finals at his first Far East tournament, but took 3rd due to the wrestle-back match. Ryo Sawa, 158lb, suffered a knee injury during the tournament, but still wrestled till the end to finish 5th. Senior, Nilay Hingarh, 215lb wrestled many close and intense matches to finish strong at 5th place. Another senior, Alex Patton, 180lb proved that he is the most dominant wrestler in the Far East by pinning his opponent in the finals to be crowned the 180lb champion. What was perhaps an odd sight was the expressions of the Titan wrestlers during as the finals bouts. All other weight class champions were jumping in joy and the runner-ups looked fairly content in exhaustion of the bout. But, the two Titan champions looked sad and almost in tears. The runner-ups were in tears and the other placers were in great shock. “It’s because these guys are a family and they gave it their very best every day at practice to be a champion but more so to win it as a team; only those that truly worked hard and sacrificed can shed such innocent tears after success or failure,” analyzed Coach Yabui. The team bond was strong as the wrestlers endured intense practices during the season and without rest during the Christmas break holidays and weekends – “together”. On and off the mat, the Titan wrestlers spent time together to meet the enormous pressure and expectation to accomplish something that no one has ever done before. While many wrestlers would be happy to just make the finals, the tremendous – almost abnormal – success that the team had built in the past 7 years also built expectations far above most other wrestlers in the league will ever have. Seeking vengeance for the second place finish of the individual team title, the Titans switched gears to go for their dual tournament title. They took to the mat another level of intensity against Kubasaki in the semi-finals to quickly defeat them 41-18 and advanced to the finals against Kinnick for the fifth consecutive time. As the dual meet was expected to be close, both teams had complex strategies, calculations, and contingency plans planned out. In simple terms, for both teams, the more dominant wrestler had to aim for pins and the less dominant ones had to stay off their backs and try to score even 1 point (as the outcome of the match score influences the dual team score).